Below is the official press release which gives the details of the soundtrack release along with the location of the free download. 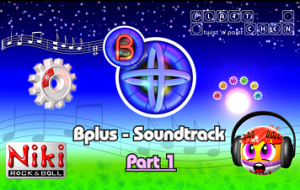 Bplus, independent software developer, today announces the release of the exclusive Bplus Soundtrack, available for download for free. Part 1 of the Bplus Soundtrack contains over 18 Minutes of the outstanding musical score of Bplus' innovative WiiWare™ titles PLÄTTCHEN - twist 'n' paint and Niki - Rock 'n' Ball, distributed in high quality MP3 format. Starting today, the first part of the soundtrack can be downloaded free of charge in the Bplus Forums. In the corresponding thread, Bernd Geiblinger, composer of the Soundtrack, also reveals exclusive insight and talks about the intentions he had when creating each piece of the rich score of Bplus' games. More parts of the Bplus Soundtrack will be released in the future. Very cool, but i don't listen to game music most of the time anyways, dont wanna listen to it in my car or something lol..
Hmm,2 more games which gave their music ready to download- just like Tomb Raider Underworld - ähhh ... ok ,why not - it can`t be that worse or can it? Now why the hell can't World of Goo do this! Interesting. I haven't played any of BPlus's titles (and after the reception for Plattchen, the reason is pretty much obvious >.> though what I've seen of Niki is pretty much starting to say otherwise...) but this sounds like something to check out. @Bahamut ZERO: don't forget the Toki Tori and LIT soundtracks, alongside the LostWinds theme... and possibly some other stuff. i might just have to look into this! Seriously, that strings piece is pure magic. I simply adore Plattchen music, frankly the best part of the game, thanks Bplus! Once I get my new lappy later this week (yay!) I'll be downloading the PC version of WoG JUST for the soundtrack. Go BPlus! Not that I've heard the music's quality, but I appreciate the gesture.